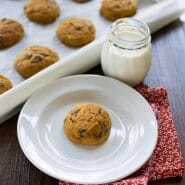 Pumpkin Chocolate Chip Cookies are light and tender cake-like pumpkin chocolate chip cookie recipe. No chilling necessary for this easy cookie recipe! Originally published 10/18/12. Updated with new photos and tips 9/17/18. I can’t believe that October is more than half over, and this is the first pumpkin thing I’ve made! 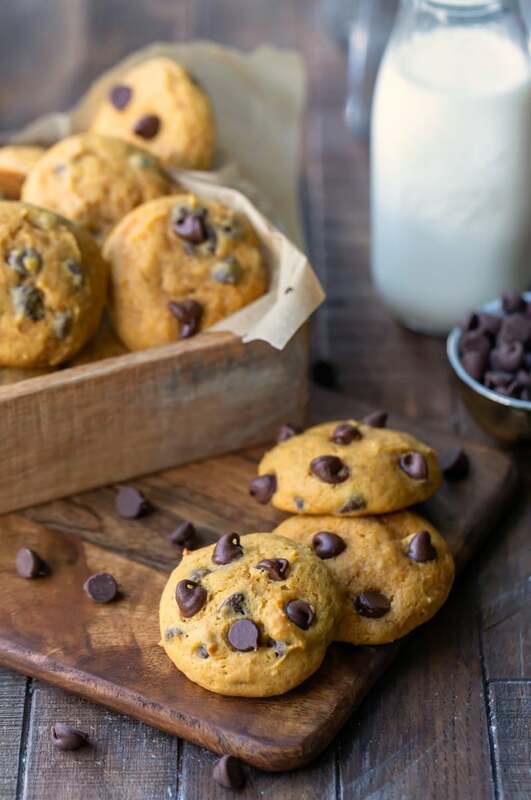 The cake flour makes these pumpkin chocolate chip cookies the lightest, fluffiest cookies ever. They’re like spiced chocolate chip-studded pumpkin clouds. These cookies are pretty simple to make. Simply beat the butter and sugar together, mix in the remaining wet ingredients, and then stir in the dry ingredients. It’s that easy! 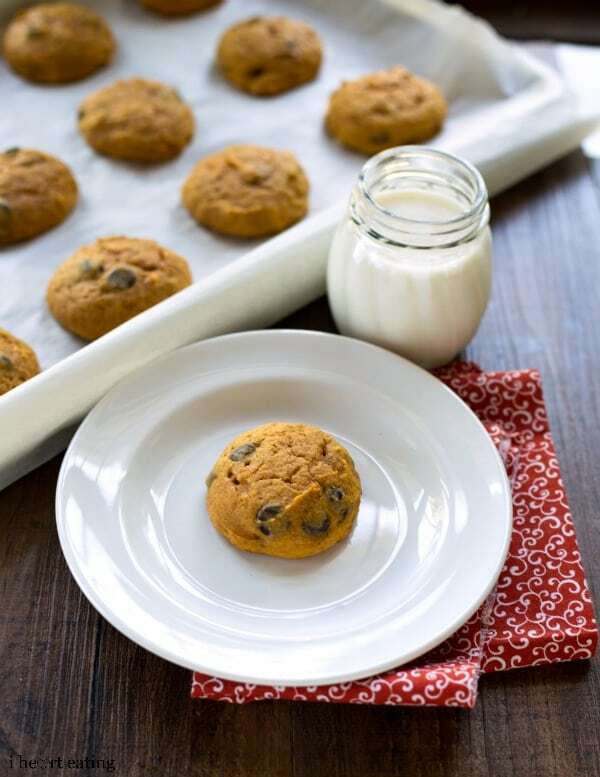 Tip – One of the keys to successfully making these cookies is to use butter that is at cool room temperature. The butter should be soft enough that you can dent it if you gently press on it with your finger. It shouldn’t be so soft that it’s softened though. If the butter is too warm, the cookies will spread too much as they bake. I’ve included a link (below) to make your own pumpkin spice blend. It’s really easy and just takes a second to stir together. If you prefer, you can use a store-bought blend in place of making your own. If you don’t use cake flour very often, it’s easy to make little batches whenever you need it. For this recipe, simply mix 2 ¼ cups all-purpose flour and 1/4 cup cornstarch together. Then, sift them together three times before using. 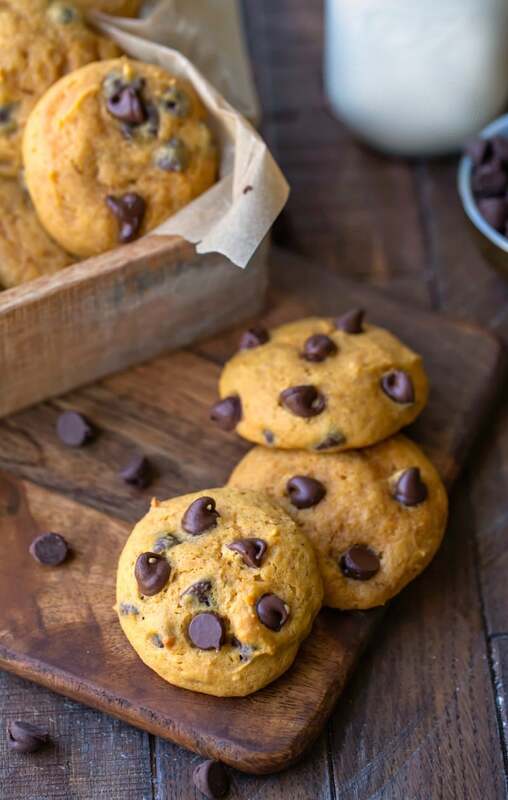 If you’ve tried this pumpkin chocolate chip cookie recipe, don’t forget to rate the recipe and leave me a comment below. I love to hear from people who’ve made my recipes! You can SUBSCRIBE to receive my latest recipe newsletters or FOLLOW ME on FACEBOOK, INSTAGRAM and PINTEREST for even more delicious food. Beat butter and sugar together for about 2 minutes or until smooth. Add egg, pumpkin, vanilla and spices. Continue beating for 2 additional minutes. Batter may look separated. Add rest of ingredients to bowl, and mix just until flour is incorporated and all ingredients are combined. Using a 1-1/2 tablespoon cookie scoop, place dough about 2-inches onto cookie sheets lined with parchment paper or silicone baking mats. Let cool completely on baking sheet before transferring to plate. *Butter should be cool enough that if you poke it, it dents a little. It shouldn't be so soft that it is mushy. **If you don't have cake flour, mix 2 ¼ c. all-purpose flour and 1/4 c. cornstarch together. Then, sift them together three times before using. ***Feel free to gently press additional chocolate chips onto the cookies before baking. these cookies were delicious and instructions were perfect.also froze well. Thank you so much! And thank you for your note about the cookies freezing well! I always get questions about how a cookie will freeze, and that’s so helpful! I won 1st prize at the 2018 Durham Connecticut Fair with the Pumpkin chocolate chip cookies. I added walnuts and got a blue ribbon in the Just for Guys cookie class. 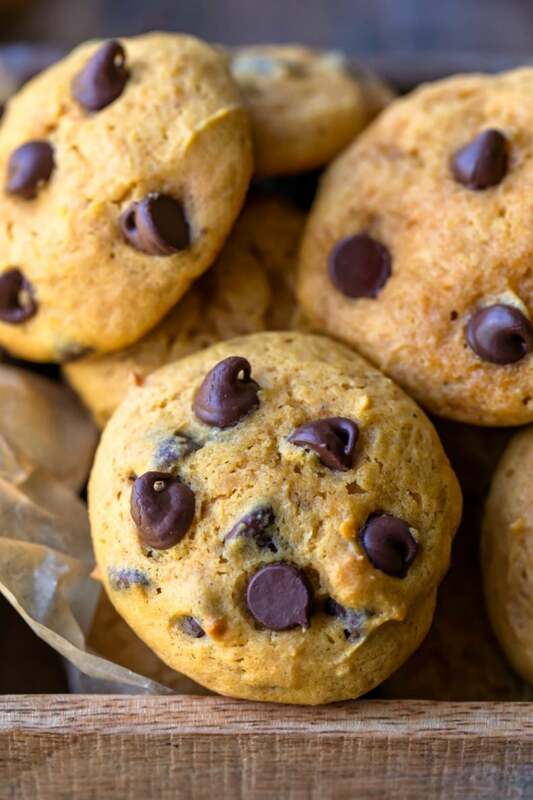 Can you refrigerate the Pumpkin Chocolate Chip cookie dough for 48 hours and can a few walnuts be added? So far without refrigeration they are very good. Just want to check since the Preheat temperature is at 375F. What about baking temperature? Still the same? Great recipe! Cookies were just as described. They’re perfectly light and just the right amount caky. They get soggy fast. Especially if you freeze them in order to eat over a period of time. Is there a way to keep them firmer? I haven’t had that issue with these cookies; they’re usually gone within a day or so. The only thing that I can think would be that since they’re pretty moist, the cookies are getting soggy in whatever they’re stored in. It may help to leave a little ventilation for them so that the condensation doesn’t build up in the container. I hope that helps! I made these last night and they turned out great! I used foil instead of parchment paper. They ended up super moist and sticky which I thought was fantastic. Definitely would recommend these! It makes about 3 dozen cookies if you make them 1-1/2 tablespoons each. I love pumpkin chip cookies! It feels like fall when I have one. Loved this recipe! Thank you for sharing. They turned out so fluffy and delish! Ten minutes is not enough. Try 25. I’ve made these cookies several times, and mine are always finished baking in about 10-12 minutes. Due to differences in oven temps, I could understand them taking as long as 15 minutes. It sounds like you had a different experience, and I know that oven temps vary, but I wouldn’t advise baking them for that long if the cookies were 1 1/2 tablespoons each.